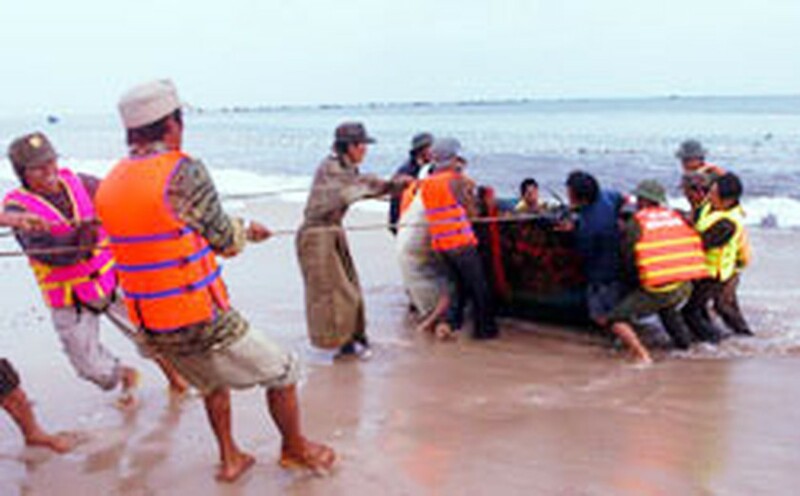 Border-guard and youth forces help fishermen in Binh Thuan province move their boats ashore. Deputy Prime Ministers Nguyen Sinh Hung and Truong Vinh Trong this morning joined a tele-meeting with the National Steering Committee for Flood and Storm Committee in Ha Noi for urgent measures to cope with the typhoon Durian. Mr. Hung stressed at the meeting that local people in the possibly affected areas should not be headless to the movement and the devastation of typhoon Durian and relevant authorities must evacuate people to safe places and ensure social order and security in these areas. The Ministry of Foreign Affairs must promptly contact with its Indonesian counterpart to timely assist eleven Vietnamese fishing boats that were held captive while finding shelter there, he added. In a previous meeting, Mr. Hung had requested the police, border-guard and youth forces to coordinate closely with relevant agencies to protect people’s lives and State property and help with rescue work. He also underscored the need to prepare post-typhoon plans to ensure sufficient food, housing and medicines for local people and the Ministry of Health must promptly carry out post-typhoon epidemic prevention plan. 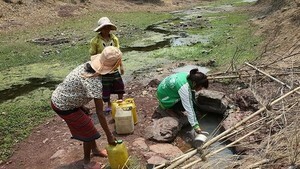 Also the same day, Deputy Prime Minister Truong Vinh Trong, who inspected typhoon prevention and control activities in the southern provinces, said the Government is also instructing local army forces to use helicopters to contact with boats still at sea and in dangerous areas along the coast, demanding them to come ashore or take shelter in safe areas. Meanwhile, the Ho Chi Minh City Flood and Storm Control Committee yesterday urged its coastal district Can Gio to evacuate people to safe places before 20:00pm since the typhoon Durian's epicenter would sweep across the southern hub today.